15.3km. That’s how far Laurent & I ran this morning. In miles, it’s 9.5, for you kilometer-impaired. I uploaded the run to my Nike+ account, and then took a screenshot of the result. I know you can’t really tell where this is, but it’s north of the center of Nantes. The beginning and end point is the Boudeau’s house. 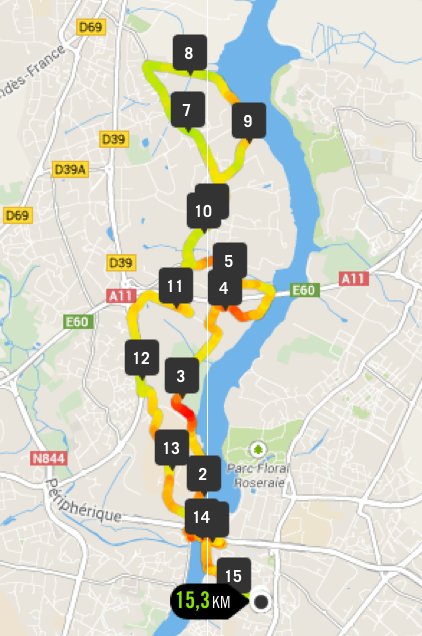 We crossed the Erdre River using the Joneliere Bridge and then ran toward the north. By the way, Melinda gave me a special GPS watch as a holiday gift last December and I use it to track all of my runs. One of the things I was excited to do in France this year is upload a run. And here I did it! This was also made possible because I brought along my dad’s old laptop. He and my mom bought new ones a couple of weeks ago. They passed on the old ones (from 2008!) to me to make use of. I’ll report on what has happened with my mom’s old laptop in a future post. Oh, if you’re wondering, it took us 82 minutes to run this far. Laurent is training to run the New York Marathon this fall.